This qualification reflects the role of workers who provide therapeutic and program related support to allied health professionals. The worker is required to conduct therapeutic and program related activities under the guidance of an allied health professional. Supervision may be direct, indirect or remote and must occur within organisation requirements. 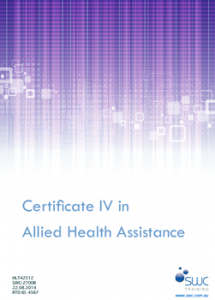 The worker is required to identify client circumstances that need additional input from the allied health professional. The worker may be engaged to work in a specialty area or work generically across the organisation in delivery of allied health assistance services. The worker, in conjunction with the allied health professional, may have responsibility for supervising other allied health assistance workers.